Twenty-five years ago, a movie that had been a really bad idea came to life in the form of a hockey team when the Mighty Ducks of Anaheim were born. On October 8th, 1993, they played their first game, and their first home game. It was versus the Detroit Red Wings. The Wings defeated them, 7-2. They outshot the Ducks 43-27. The goalie of record for the Ducks that night, Guy Hebert, was in attendance on October 8th, 2018. No big trick, as he now works as a studio analyst for the team. But the team also brought out the man who scored their first franchise goal, Sean Hill. He looks good still, fit. That first night, after getting that goal, he later took the team’s first penalty, a holding call, at 11:31 of the second period. The goal came at 4:13 of the second, with Detroit already up by three goals. They would eventually get up 7-1 before the Ducks would put in another one, at 11:47 of the third period. Troy Loney got that one. The team would also record its first fight on this night, though just barely. Stu Grimson and Bob Probert tangled at 14:51 of the third. Who knows if there was a precipitating cause—old score sheets don’t tell that. But if not, then it’s part of a sad legacy when you think about how tragically Probert’s life went in the years closer to the now. Who needs to fight with five minutes left in a game in early October? But enough about opening night. A decade later, the team would lose the Stanley Cup. Four years after that, as the Anaheim Ducks, they would win it. 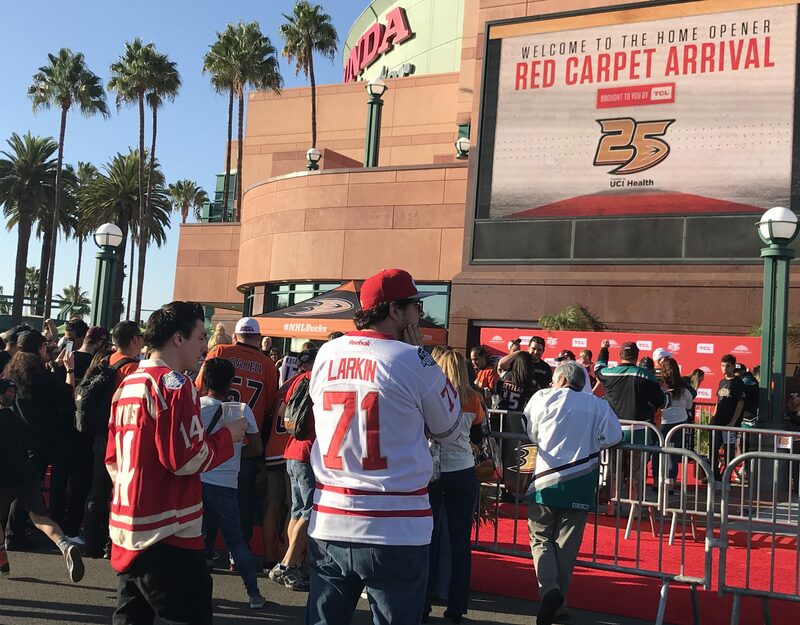 Two of the players from that team, Ryan Getzlaf and Corey Perry, were in the house as the team kicked off the home portion of its 25th anniversary season Monday night. Neither was playing. They were introduced, along with other non-playing members of the team (Kesler, Eaves, both sidelined), from the bench. That means that the last tangible link to the Stanley Cup team to be active, at least on this day, was Coach Randy Carlyle. And even he does not form a continuous line back to the Cup team. He was fired in the 2012 season and rehired prior to the 2016 campaign. But the playing lineup was new, and perhaps it’s time to just recognize that the page has turned. If the Ducks are going to win, they’re going to do it with a crew that is way less familiar than the Kariyas and Selannes of old. That didn’t stop them from playing to the past. The warmup jerseys were old-school. The playing ones were throwback-style, somewhat reinvented. But the names: Schenn, Steel, Street, Comtois, Lundestrom, Sustr, Sherwood. These are not the Anaheim Ducks of last spring. There is still some continuity to the recent past. Cam Fowler held down the blueline. Jakob Silfverberg played right wing. Rickard Rakell was on the top line. In net: John Gibson, who has had his place solidified with an eight-year contract and has the potential to be Giguere-like over time if he retains his health. But for every even vaguely familiar face, there was one or more who were newbies. Most of them were forwards: Troy Terry, four NHL games. Max Comtois, Kiefer Sherwood, and Sam Steel, two games apiece. Isac Lundestrom, making his debut. If there was anything good, it was that their defense is relatively experienced, with just one relatively untested player: Marcus Pettersson, with 24 games. On the contrary side, the Detroit Red Wings came in with six untested players, but most of them were on the defense. They included Libor Sulak, Filip Hronek, and Dennis Cholowski, two games each, and Joe Hicketts, six games of NHL experience. Three assists, though. On forward, the Wings had two youngsters, Michael Rasumussen and Christoffer Ehn, with two games of experience. The play didn’t look like what all that inexperience should have suggested. The Red Wings were good on defense, and the Ducks kind of porous. The opposite side of it, though, did hold true. The Ducks were weak on offense, and the Wings pretty good. That’s why the Wings were up 1-0 after twenty minutes. Tyler Bertuzzi got the marker. You could say one thing about period two: that’s where the action was. The Red Wings scored another goal, but not immediately. The frame started off with the Ducks on the PP, quickly negated when Fowler had to slash a guy who got behind him at the blueline. That wasn’t the only sloppy play of the twenty minutes. Athanasiou got a breakaway and used the deke, deke, hold across the slot method before putting the puck up and over Gibson. Shortly after that, a shot led to a rebound off Gibson’s glove, and Abdelkader came in to get a try at it. He swept it wide on the backhand. Then the Ducks got a goal from the left wall, not a great one. It at first appeared to be tipped in front by Kiefer Sherwood, and would have been his first NHL goal, but the scorers gave it to Lindholm. It was scored from sufficiently far away, up and over the goalie’s far shoulder, to be, if not bad, then at least not-great. The wide-open hockey continued. Thomas Vanek chased a puck to the net in what would have basically been a breakaway, except the puck kept rolling, rolling, rolling away from him. He did get a swipe at it as it got to Gibson. The Ducks almost went up a goal when the puck came in on a snapshot from Marcus Pettersson. On the way in, Silfverberg got a leg on it. It hit the post and came straight back out. The Ducks’ Troy Terry put a flip pass in to Henrique close to the net. He got off a backhand shot. Saved by Jimmy Howard. Detroit got their second goal of the night following that. Everyone was going to the net. Darren Helm took a shot. It came straight back to him off the defenseman sprawling in front of him, and he shot again, a backhander. It beat Gibson. The Ducks had a chance to get a goal. Silfverberg had the puck breaking in from the blueline. He went backwards with a pass and lost it. Backwards! Why? Ducks fans hoped the third period would be better. It was, and if you want to see it like this, the Ducks avenged their loss 25 years ago with a 3-2 win. It came in the shootout. The tying goal, first, was Silfverberg’s, his first of the year. The work was Henrique’s. He went across the slot with the puck and shot as he fell. The rebound came to his mate, and he slammed it in. There was a brief review for goalie interference which came to nothing. The Ducks had knotted it at 8:29 of the period. He did say, offhanded as we were leaving the room, “I should have buried one of my other eight chances during the night.” But he was happy, and he looks confident. He had earlier indicated that he is getting more comfortable. “There were opportunities for young players to come into our lineup. We said we were going to transition youth into our lineup this year. I just didn’t think we planned to have six of them in the lineup in game three.” And especially not five forwards. In fact, of the Ducks’ 12 forwards, only four are familiar: Rakell, Henrique, Silfverberg, and Cogliano. The Ducks survived the mix-and-match. They now just have to adjust to the idea that “veteran” leadership resides in guys like Fowler (26) and Cogliano (31) rather than in the players that everyone thought had another run left in them. Ryan Getzlaf is day-to-day. I spotted Corey Perry in a huge leg brace, worn over his skinny-pants suit. Patrick Eaves was also around, looking strong. The Ducks now play Arizona at home Wednesday night. They then go on the road for two games.